If you want to create work on your terms, you need to stop asking for permission. I’m serious! The biggest mindset shift you are going to need to make to become self-employed is to stop asking for permission. You might not recognize it, but traditional employment is a permission-based work system. You don’t get to work without asking for permission. When you get a college degree you are asking for permission to learn something. When you apply for a job, you are asking for permission to work. When you request a promotion, you are asking for permission to grow. When you request a pay raise, you are asking for permission to make more money. When you want to take a vacation or spend time taking care of a loved one, you are asking for permission to live your life. During any given workday, you might need to ask for when you get to eat lunch or when you want to leave work early or what projects you work on or choosing how you work on a particular task. In too many workplaces today you are still told how to work, not asked what makes you uniquely productive. It is implied in our existing social contract for work to submit to the will and needs of corporations. If you want to work in a different way, you need to ask for permission. And this culture of asking permission was beat into our heads way back in school. We were constantly told to “follow the directions”. We were taught to defer to the opinion of authority figures, instead of thinking for ourselves. We were conditioned to follow a daily schedule, so we would never question the wisdom of the 9-to-5 workday. When you work for yourself, you only need to ask permission of yourself and no one else. 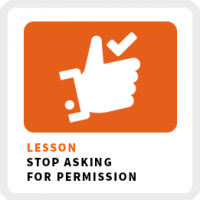 Asking for permission is deep seeded into our mindset and habits. It’s not a behavior you are going to break overnight. You unknowingly ask for permission far more often than you could have ever imagined. Many of the people I coach struggle with knowing how to get started on their business. When you’ve spent most of your work experience waiting for management to tell you what to do, it’s tough figuring how to get started all on your own. The only person to tell you is you. There is no one above you to ask for permission. You have more answers to your questions than you know. Give yourself the permission to find them. We have been so conditioned to seek approval from those with more experience, first-time entrepreneurs feel inadequate. When you seek credentials conferred by others, you are asking for permission. I remind my community that in the absence of experience, their customers value being part of their journey. It’s true. Many times, collaborating with your customers and sharing what you’ve learned is far more valuable because they feel like they are part of your process. Also, the role of the all-knowing expert and manager is changing because everything is changing so fast now. It’s impossible to know everything in your field of expertise. The only way to truly develop your expertise is through constant experimentation and practice. For example, I’d rather learn from an upstart entrepreneur than an MBA professor who hasn’t run a business in the past decade. I know this might be hard to wrap your head around, but when you work for yourself, many times you work without getting paid. Especially when you are starting out. Don’t expect to get paid on the first day like you would for a traditional job. I started this business in January 2016 and only recently, have I started to get paid for my efforts. I’ve been building my community, listening to them, getting to know their needs and testing solutions to solve their problems. Of course, I want to get paid for my work, but I’m not waiting around for someone to pay me to get better at my craft. A paycheck is asking for permission to work. I’m not asking f0r anyone’s permission to work. Many people hold themselves back from self-employment because they don’t trust their ability to manage themselves. To a certain extent, I get it. Afterall, we were taught to ask for permission. We have more faith in someone else managing us than ourselves because we’ve never been encouraged to do so. Like it or not, the future of work is self-management, even if you are a traditional employee. I’ve learned the most effective method for learning how to manage yourself is by working for yourself. So what are some strategies for breaking your addiction to asking for permission? Get in the habit of asking yourself for permission first before seeking the permission of others. Just ask yourself what it is you want from a given situation. Give yourself the permission to get started on your business. Give yourself the permission to work without getting paid to build your experience. Give yourself the permission to learn how to manage yourself. When my sister and I needed help with our homework growing up, my parents told us to get as far as we could on our own before we could ask them a question. They did that because they wanted us to be able to get started on our own. They helped us realize we could get further than we thought if we learned to rely on our natural curiosity to figure stuff out on our own. I know it’s easier to just ask someone for the answer, but in a world where the pace of change is accelerating, fewer people are going to have all the answers. You are going to need to cultivate your curiosity by creating experiments to find your own answers. In today’s fast-changing economy, you will be far more valuable by taking the initiative to solve a problem, compared to someone waiting to be told what to do. Don’t wait for someone else to define your value, take the initiative by explaining your value by finding problems to solve based on your unique skills and experiences. Stop asking for permission to do the work you’ve always wanted to do and in the way you want to do it.